If you want to see the Choir stop singing when you walk in, you need to start wearing dress shirts by Steven Land. Made of 100% pure Cotton, Steven Land shirts are what the well dressed man wears. 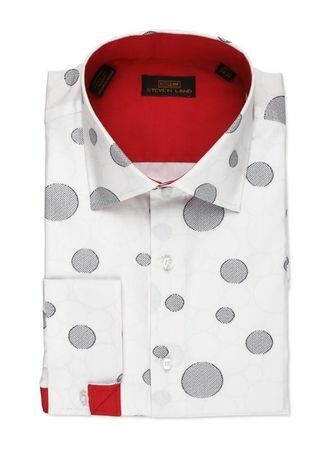 This white with black dot Steven Land Dress Shirt has red flip cuffs. Don't forget to get yourself a Steven Land Big Knot Ties. It's style you can't ignore. See More Steven Land Shirts Here. Have you shopped for Steven Land Shoes yet.